South African authorities long had eyes on Rogers Mukwena. They knew the former schoolteacher was wanted in Zimbabwe for poaching rhinoceroses and selling their horns, which can command hundreds of thousands of dollars. His subsequent conviction resulted from a new tactic in wildlife preservation: The genetic fingerprinting methods that have been so successful in the criminal justice system are now being used to solve poaching crimes. First, researchers in South Africa had to build a large database of genetic samples drawn from African rhinoceroses. The DNA would be used to match a carcass to a particular horn discovered on a suspected poacher or trafficker, or to rhinoceros blood on his clothes, knives or axes. To make that possible, Dr. Cindy Harper, a veterinarian at the University of Pretoria, and her colleagues collected DNA from every rhinoceros they could find — more than 20,000 so far. They have taught park rangers how to retrieve blood, tissue or hair samples from every rhinoceros that is killed, dehorned or moved. The rangers have learned forensic crime-scene principles and the importance of the so-called chain of custody to ensure that the samples are not corrupted. Harper’s lab performs the analysis and stores DNA fingerprints. The scientists’ database, which they call Rhodis, is modeled after Codis, the FBI system used to link the DNA of suspects to evidence at a crime scene. The approach is promising, said Crawford Allan, senior director of Traffic, which monitors illegal wildlife trade at the World Wildlife Fund. Poaching has escalated exponentially in the past decade, he noted. More than 7,000 rhinos have been killed in the past 10 years. The World Wildlife Fund estimates that 20,00 to 30,000 African elephants are killed each year for their tusks. Their tusks and horns are trafficked through experienced criminal networks. “You really need sophisticated tools to help solve these crimes,” Allan said. The rhino project provides “a ‘cold hit’ database,” said Stephen J. O’Brien, referring to the identification of a perpetrator by DNA when there are no other apparent clues. O’Brien, an expert on DNA fingerprinting and chief scientific officer of the Theodosius Dobzhansky Center for Genome Bioinformatics at St. Petersburg State University in Russia, is co-author of a new paper, published last month in Current Biology, describing the anti-poaching effort. A similar attempt to use DNA to convict poachers is led by Sam Wasser, director of the Center for Conservation Biology at the University of Washington. His group’s focus is African elephants. Over a period of 15 years, he and his colleagues have collected and analyzed DNA from dung to create a map of the ranges of various elephant groups based on their genetic differences. It helps show where ivory seized from poachers originated. 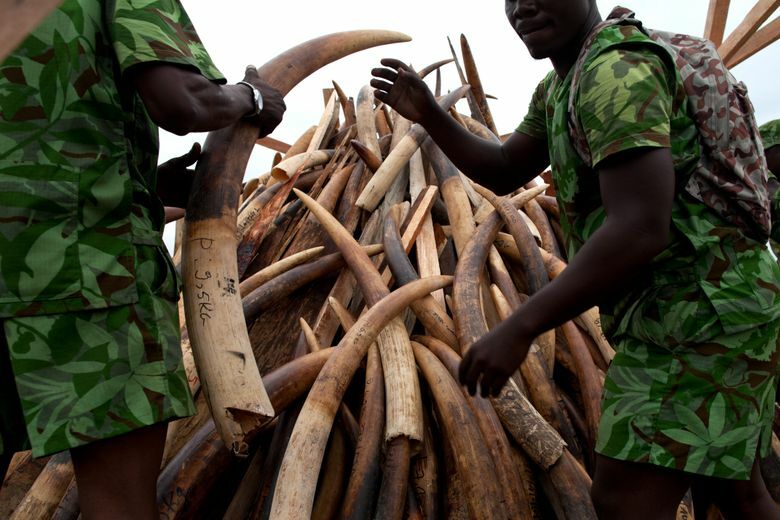 The project has not linked specific carcasses to specific tusks recovered from traffickers. But the analysis has provided valuable clues about the regions in which poachers are operating. “To our surprise, the ivory was consistently coming from two areas,” Wasser said. Tusks from savanna elephants were initially coming from southeastern Tanzania and northern Mozambique, the data showed, but the illegal trade then shifted northward to southern Kenya. Tusks from forest elephants originated in a small triangular area in northeast Gabon, northwest Republic of Congo, and southeastern Cameroon. “Instead of focusing everywhere, if we really want the big criminals we should focus on those two spots,” Wasser said. The sale of ivory and rhino horns is hugely lucrative. Rhino horns may bring $60,000 or more per kilogram. A horn generally weighs a few kilograms, but a few have been as heavy as 10 kilograms, or about 22 pounds. The poacher sells horns to a trafficker, who disguises them and ships them to destination countries, mainly Vietnam and China. Some horns are carved into jewelry while still in South Africa, which can make it extremely difficult to trace them. Some seizures have uncovered as much as 7 tons of ivory in a single shipment, Wasser said. Ivory is primarily bought by collectors or as an investment.